The last post in this series saw my wife and me preparing to move to Austin, Texas where I would attend graduate school at The University of Texas. Having grown up in the Midwest, I was in for a bit of a culture shock that started even as we drove across the Texas state line. The sky suddenly seemed big, huge, expansive beyond belief. In fact, the massive, blue vault of heaven remains one of my favorite memories about the state we quickly came to love. Along with the size of the sky were the outlandish proportions of just about everything else, including hospitality. Some of the finest people you will ever meet live in Texas, and I still admire the genteel quality of life that sees even grown adults saying "sir" and "ma'am" to their elders. And did I mention barbecue? Ah, but that is for another post. At UT I had wonderful professors, such as Bill Nethercut for Medieval Latin, Douglass Parker for New Testament Greek, Andrew Riggsby for Cicero, M. Gwyn Morgan for Tacitus, Peter Green for Greek history, Michael Gagarin and Paul Woodruff for a seminar on the Sophists, Paula Perlman for Herodotus, Tim Moore for Latin Literature, and Gareth Morgan for Latin teaching methods. My time at UT was wonderful, for it was then that I truly developed the ability to read Latin in addition to translating it. The sheer volume of texts through which we had to work required it! I can still remember the day, sitting in my office, when I realized that I had just read several pages of Cicero without really translating them. It was an exciting moment. I quickly took on teaching duties at UT and taught several undergraduate classes, some in beginning Latin and others in Latin literature. I came to appreciate having just taught at the middle school level, for the ability to explain and make things clear had been honed there. I enjoyed teaching so much, and came to see that, while I enjoyed (and still enjoy) the heady thrills of academic research, my path lay in the secondary classroom. After completing my Master of Arts in Classics, with a minor area in philosophy, I decided to leave the Ph.D. track that I had contemplated and make the move back to full-time teaching. Before leaving this part of the story, however, I would like to recall a few special moments. On one occasion, my wife's father came to visit us, and they picked me up on campus. I think he thought I was quite rude, because for some time I was silent. In truth, I was unable to speak. More than once I experience such muteness when caught up in the delights of deep research. My mind would go so far into its thoughts that the physical act of speech became impossible, or at least extraordinarily difficult. Once, when I looked out my office window, I saw Dr. David Armstrong walking up the sloping hillside toward Waggener Hall, home of the Classics department. He slowed and then stopped in the middle of the hill, staring somewhat at the ground. After several moments he moved on again. I smiled, for I knew exactly what had happened. He had become so engrossed in thought that his body had ceased to move. Another part of my time at UT involved my coursework in cognitive science. This was still a fairly new area, and the class I took was as intriguing as anything in Classics. In fact, after searching for an article by Kip Thorne on the possibilities of time travel in the physics-math-astronomy library and nearly devouring all of Michio Kaku's Hyperspace in a bookstore before buying it, I nearly switched my focus to physics and philosophy. In fact, one of the publications of which I am most proud is an article I wrote addressing philosophy, aspects of quantum theory, and theology. 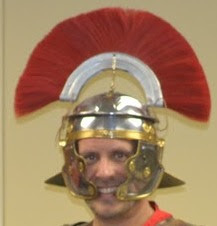 As I said earlier, it became clear that my path lay in the secondary classroom, and it is to this I shall turn in the next installment of "Forging a Centurion." 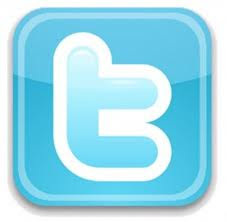 Follow Roman Personas on Twitter! 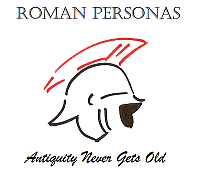 Follow Roman Personas on Facebook! Get all your Roman Personas gear at Cafe Press! Copyright (c) 2011 by Steven R. Perkins. Travel theme. Theme images by sandoclr. Powered by Blogger.